I didn’t care much for the first Disney Cars film when it came out in 2006, however since then I’ve had a son. He adores Cars and has just about every piece of merchandise with Lightning McQueen on it. He has watched the DVD so many times that the disc now sticks and requires replacing. Over the multiple viewings it’s grown on me and I’ve even learnt to love Mater. 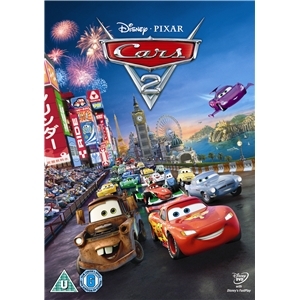 We went to see Cars 2 in 3D full of enthusiasm and excited to see the latest installment. It was a let down, my son got bored and wanted to run around and I wanted to go back and see the far superior Rio. The story this time involves Mater being mistaken for a super intelligent spy. Visually it is up to the high quality you’d expect from Pixar, but plot and story wise it’s extremely poor. It’s a parody on a Bond film that we’ve seen done a thousand times. To me this movie was Pixar apologising to Disney for making Up, a film they couldn’t sell toys about. The best thing on this disc, is the Toy Story short that is on the extra features. A third installment is inevitable, due to it being a huge cash-cow. Let’s just hope they actually have a story instead of a toy commercial.